LaViolette was also able to find the place where this solar event appears to be registered in the Greenland ice core record. He did this by matching up the Cariaco Basin climatic profile with that of the GISP2 Summit, Greenland ice core. 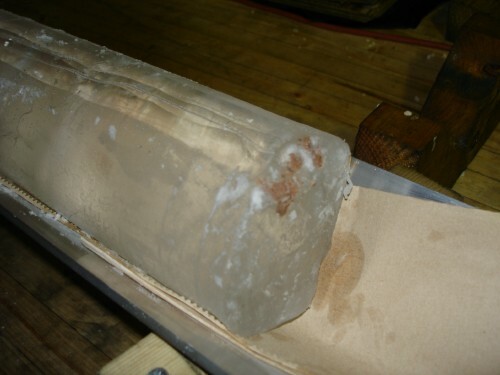 He found that a very large magnitude acidity spike was formed on this 12,837 years BP date, found in the ice record at a depth of 1708.65 meters and that it also was associated with high nitrate ion concentration peaks, both of which were the highest in the Younger Dryas portion of the ice record. This depth also corresponds with a rapid rise in the core’s concentration of beryllium-10. All of these, ice acidity, nitrate ion concentration, and 10Be deposition rate, are good indicators that the Earth had experienced a sudden influx of cosmic rays at that time. Furthermore LaViolette noticed that nitrate ion concentration did not peak in coincidence with the acidity peak, as is observed to be the case in ice records of contemporary SPEs. Instead, nitrate ion reached a peak on either side of the acidity spike and produced a conspicuous trough at the time of the spike. This suggested to him that the SPE had been so intense that its stratospheric ions were able to destroy the polar ozone layer and allow solar UV to penetrate the atmosphere which in turn would have photolytically dissociated the nitrate ions in snow deposited at that time. 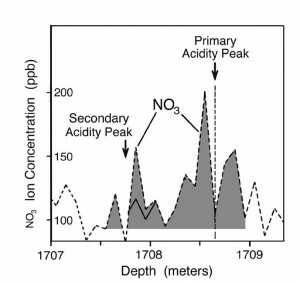 The NOx gas so released would then have diffused to deeper levels where it would have recombined to form nitrate ions, thus displacing the nitrate peak. Once the ozone layer had reestablished itself, the precipitating nitrate ions would have been allowed to build up once again and produce the other flanking nitrate peak. The breadth of the nitrate trough indicated that polar regions were being exposed to UV for a period of several years. If the stratospheric ozone layer was significantly depleted also at mid latitudes, which seems likely, it would have posed an additional hazard to animal life, exacerbating the radiation hazard due to the SPE. LaViolette also reports that the 12,837 years BP acidity spike coincides with an abrupt climatic cooling and interprets this as an expected consequence of solar cosmic ray exposure. That is, the impact of the solar proton event and its direct contact with the Earth’s atmosphere would have generated high concentrations of condensation nuclei in the stratosphere which would have had a cooling effect on climate. He noted that this proposed super SPE also occurred midway between two very warm climatic intervals separated from one another by about one solar cycle period. The warming that followed this event was one of the most pronounced climatic oscillations of the entire Younger Dryas with polar temperatures briefly reaching levels of warmth characteristic of the Alleröd interstadial. He notes that aridity associated with this period of unusual climatic warmth must have contributed to the occurrence of wildfires since high ammonium ion concentrations coincide with each of these warm intervals, ammonium ion being a recognized wildfire indicator. He notes that hazards associated with these fires as well as the associated destruction of food supplies and habitats would have also contributed to the megafaunal termination.